Facebook often plays in the political/religious space. However, the social media platform’s big cheese, Mark Zuckerberg, has issued a big “no” to Christians who demanded a crucifix emoji. Last month, Facebook unveiled a rainbow flag emoji which allowed users to celebrate and honour the LGBTQ community. This irked a number of right-wing Christians in the US who believed they deserved a cross of their own. 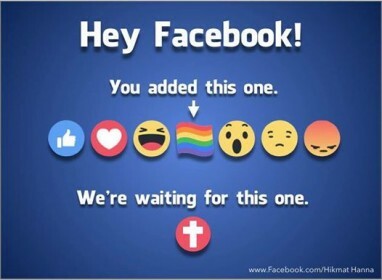 Hikmat Hanna, a Conservative Christian, argued if the LGBTQ flag was fine for Facebook then surely it would have no problems with a crucifix emoji too. The idea caught the eye of famed Arizona-based evangelist and renowned internet provocateur Joshua Feuerstein who stated demanding Facebook create an emoji for its Christian fanbase. Feuerstein’s Facebook protest has attracted some 20,000 likes, however, most people pointed out that if the Christians were to get their own emoji then it was only fair all the other religions did too.